And in the movie Star Trek (#11 - the first Abrams one), Kirk's mother gave birth to him while they were abandoning the ship, also a stressful environment. Are there any examples of someone giving birth in a relaxed environment with proper maternity care so we can see how the process is supposed to be handled in the future? Particularly within the Federation. 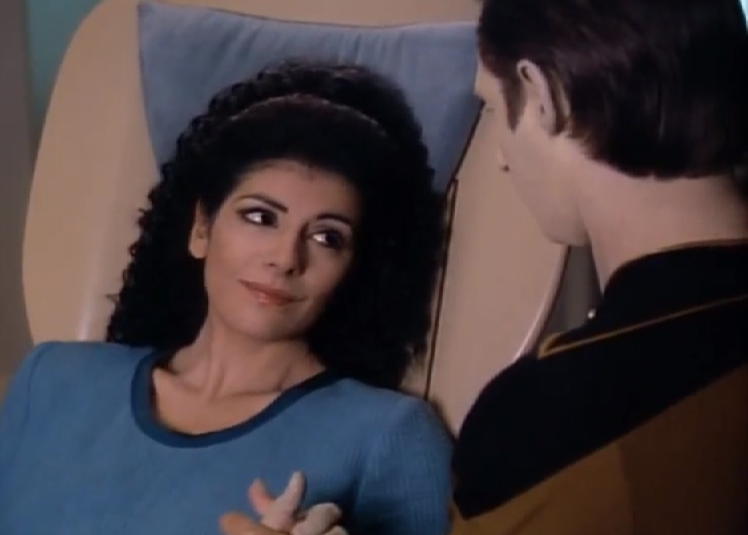 Troi gives birth in the episode TNG: The Child. The lights are dimmed and she's sitting in a sort of 'birthing chair' with stirrups. Since they've had at least a few hours to prepare for her arrival this is, we can reasonably assume, the normal birthing procedure for human women in the Federation. The original screenplay also indicates that pain, pain relief and trauma are all still part of the normal process of giving birth in the 24th Century along with ensuring that the mother remain awake and alert in order to experience the birth. PULASKI: (continuing) I'll give you something for the pain. It won't in any way diminish the experience. PULASKI: I have delivered dozens of babies. But none like this. There was no pain, no trauma. It was effortless for both of them. We see another Federation birth (albeit from an earlier era and on-planet) in Star Trek V. Spock's mother gives birth lying on a big rock in a cave with a priestess to act as midwife. The film script indicates that there's no modern technology involved and no pain relief. You might wish to note that while Fetal Transport does exist, it's (presumably) generally avoided because it can lead to post-birth complications in the child. In the single case that we see it on-screen, the transport apparently causes young Naomi Wildman to suffer a deadly (albeit treatable) condition. Which depicts the Bajoran childbirth process (Kira is a surrogate for O'Brien and Keiko). In this depiction, the stress and difficulty of childbirth seems more related to the inability of the men in Kira's life to cope with the situation than the birthing process itself. Why is the Federation so poorly patrolled? Can Borg survive in outer space without an environment suit? Are all Jem'Hadar implicit killers at birth? What is the status of holographic sentience in the Federation? Is every Federation star ship different? Federation Technology Adapted From Aliens? Can non-Federation members join Starfleet? Yesterday's Enterprise & Federation Klingon War?